Well, the most wonderful time of the year is now upon us! 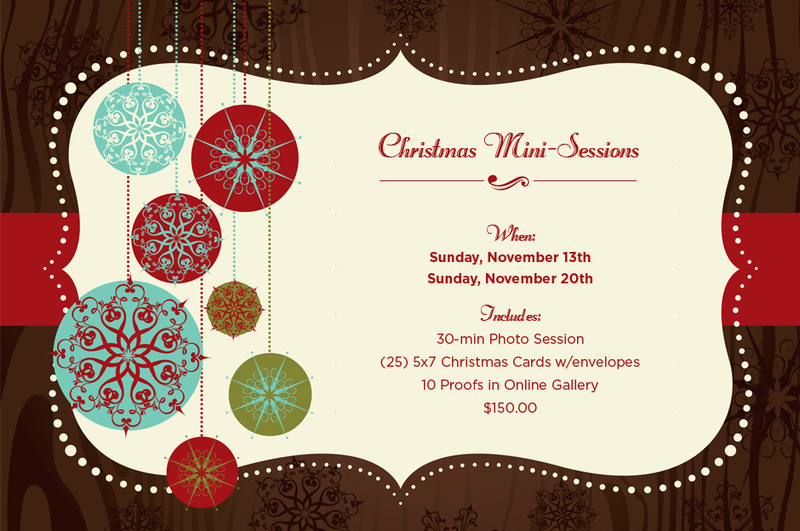 This year we are introducing something a little different for you all – Christmas Mini-Sessions. This is a great time to get some updated photos of you, the hubby and any little ones you have added to the family. Exact location/times will be available upon booking. What it includes: 30-minutes in front of the camera with 1-4 people ($25 per additional child/person), (25) 5×7 Christmas Cards w/envelopes, 10 proofs in your online gallery. Availability is limited, so hurry to book your session. Please email [email protected] to reserve your spot. **Please note: 1 hour sessions are still available – please let us know when enquiring which session you are interested in.